For Mr. Darren M. Shapiro, Esq. the divorce mediation process is most successful when it is approached as a joint venture between two ex-spouses prepared to come to agreeable terms about their future through neutral and supported negotiation. As such, he believes that caucusing is rarely the right decision in family law, and a method he attempts to avoid whenever possible. In divorce mediation, caucusing takes place when the mediation is held with a series of private meetings between each participant and the mediator. For some people, this one-on-one meeting is a limited experience which is done in an attempt to resolve a sudden issue, for others, caucusing takes place throughout the entire negotiation and settlement. For Mr. Shapiro, however, the process of separating clients for the purpose of dispute resolution can be counterproductive and problematic. Indeed, he finds that these separated conversations can lead to a disruption in the empathy that is essential to mediation success, and can even make participants feel as though the mediator is conspiring against them with the other party. In divorce circumstances, when emotions are running high, Mr. Shapiro believes that the best solution is to minimize any feelings of paranoia or discomfort that both spouses may feel by presenting the mediator as a completely neutral subject. However, the cause for caucusing can be made in some exceptions, and some mediators believe it to be a reliable solution when certain problems arise. For instance, Mr. Darren Shapiro regularly attempts to avoid conflict escalations during his mediation and allow clients to manage difficult emotions. In a perfect world, these issues would be managed by allowing each spouse to discuss their concerns in turn. Unfortunately, some instances may end with certain clients refusing to reveal information with another client present - particularly when there is an essence of threat present. For instance, caucusing may become necessary when issues of physical violence have been present in the past or may be in place during the divorce mediation. In some cases, even though communication appears to be open and honest, divorcing spouses struggle to reveal crucial concerns in front of their ex. In Mr. Shapiro's opinion, caucusing should only be considered when all circumstances have been addressed and separate conversations appear to be the best way to maintain progress. The ability of caucusing to open up feelings of suspicion between parties can put the transparency of the mediation process at risk. Some divorce mediators use caucusing in an attempt to get information from a client who refuses to speak in front of their ex, while some use caucusing as a way to let their clients "sound off" without angering the other client. In particular instances, caucusing may even be a way to test various solutions with each side, or offer coping solutions in emotional circumstances. Caucusing can provide a sense of relief in periods of tension, and allow spouses to share information they would otherwise be uncomfortable providing. What's more, caucus-based mediation can be appropriate when speaking in front of the other client might cause one client to appear uncertain or weak. It can even provide a safe haven for parties who are concerned about violence at the hands of other parties, or need to digest information in an emotionally secure location. There are many professionals in family law that believe caucusing has a crucial role to play when it comes to managing dispute resolution in certain cases. Mr. Darren Shapiro recognizes that caucusing can be valuable in the right settings, however, he attempts to stay away from it as much as possible, due to his belief that it damages the inherent benefits of mediation. Mr. Shapiro, and many other mediators believe that caucusing is a poor way to conduct the mediation process, whereas others support the idea of caucusing as a valuable solution to certain clients. For Mr. Shapiro, caucusing simply detracts from the trust and neutrality that is essential to mediation. In mediation, clients are encouraged to come together to find a collaborative solution to an existing problem - and that attempt to negotiate can be damaged without any face-to-face interaction. Instead, the process becomes similar to a game of Chinese whispers. Even in cases wherein caucusing is limited to a number of brief interactions, these secret conversations can cause each spouse to feel nervous and suspicious about what is being said behind their back. That means that even though the mediator is working hard to remain neutral, the parties at the end of the mediation feel as though they've been "ganged-up-against" or unfairly treated. This detracts from the numerous benefits of mediation as a solution for coming to an agreement in which both sides feel as though their opinions have been heard. As Mr. Shapiro often points out, it's crucial for clients to know that their mediator is a completely neutral party - not responsible for taking sides or making decisions on the behalf of either client. A mediator is always there to help the individuals involved in the divorce evaluate their future and find a solution that they can both live with. Mr. Darren M. Shapiro believes that joint mediation offers a chance to build a negotiation through trust, transparency, and empathy -as well as the clear neutrality of the mediator. 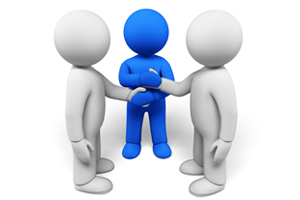 In joint mediation, both clients can feel as though their issues have been heard and obstacles have been overcome. Both clients are given the chance to air their worries without worrying about secrets that are revealed without their knowledge, and joint mediation can even help partners to maintain stronger relationships for the benefit of children involved and future interactions. Though Mr. Shapiro will always consider whatever solution is best for his clients, and work to ensure that a couple stays away from litigation wherever possible as a mediator, he finds that joint mediation is often the best solution. If you would like to discuss the options available to you in mediation, please contact our principal Mr. Darren M. Shapiro at your earliest convenience to discuss your free half-hour consultation with your spouse. You can get in touch either through our online form or over the phone at 516-333-6555.